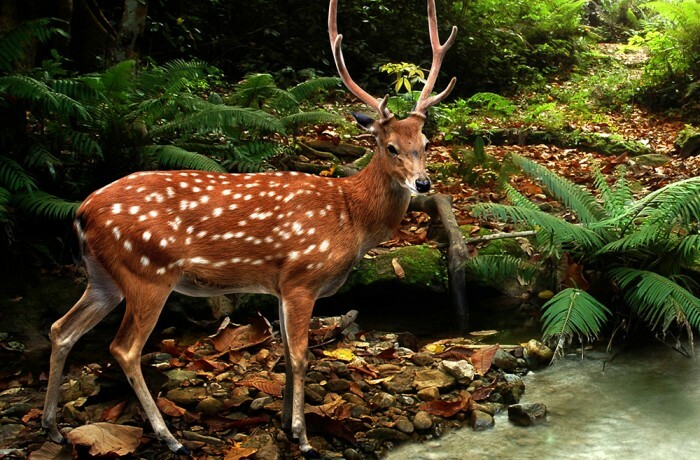 King David, from whose tribe Jesus descends, compares his seeking the Lord to a deer thirsting for running water. We have here a symbolic reference to two sacraments, that of Baptism (water), and Eucharist (God Himself). Water can also be the cleansing water of the sacrament of Confession (grace). The deer then, is symbolic of the soul and its image is often found on baptismal fonts. The deer (or stag), loves the solitude of the mountains and moves about freely seeking and longing for Christ, and as in the Solomon’s Song of Songs and in the Spiritual Canticle of St. John of the Cross, the wounded stag seeks its lover. The stag has also been described as a killer of snakes, drawing them out of rock crevices and trampling them to death. In that the snake is symbolic of evil, the stag resembles Christ here in His killing of evil.